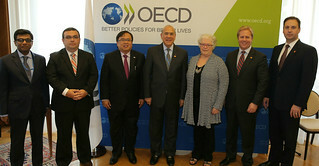 4/06/2015 - In a boost for international efforts to strengthen co-operation against offshore tax evasion, seven new countries have joined the agreement to exchange information automatically under the OECD/G20 standard. Australia, Canada, Chile, Costa Rica, India, Indonesia and New Zealand became the latest countries to join the Multilateral Competent Authority Agreement (MCAA), bringing the total number of jurisdictions to 61. The Agreement implements the Exchange of information, developed by the OECD and G20 countries and presented in 2014. The Standard provides for annual automatic exchange between governments of financial account information, including balances, interest, dividends and sales proceeds from financial assets. It covers accounts held by individuals and entities, including trusts and foundations. To date, 94 jurisdictions have committed to implement the Standard, agreeing to launch the first automatic information exchanges in 2017 or 2018. The MCAA is a framework administrative agreement used in conjunction with the Convention on Mutual Administrative Assistance in Tax Matters, which is the most comprehensive multilateral instrument available to countries for all forms of tax co-operation to tackle tax evasion and avoidance. For further information on the Standard for Automatic Exchange of Financial Account Information in Tax Matters and the Multilateral Competent Authority Agreement, go to: www.oecd.org/tax/automaticexchange.htm. Media queries should be directed to Pascal Saint-Amans, Director of the OECD’s Centre for Tax Policy and Administration (CTPA) (+ 33 6 26 30 49 23), Achim Pross, Head of the International Co-operation and Tax Administration Division (Tel. : +33 1 45 24 98 92), or the OECD Media Office (+33 1 45 24 97 00).